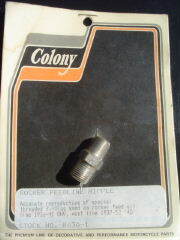 Accurate reproduction of special threaded fitting used on rocker feed oil line 1936-1941 O.H.V. Also is the vent line fitting on 1937-1964 Harley 45. Colony Stock #'s 9738-1 & 8630-1.